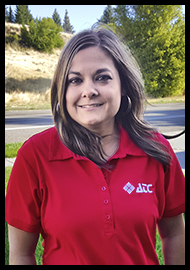 Another supportive member of the ATC team is Karlee Ramsey, our HR and Accounts Payable officer, otherwise known as ATC’s “Support Operative”. Karlee has been with the company since summer of 2017, and enjoys staying up to date on employment law changes and coordinating the company’s payables. Karlee loves Mexican food, and is always game to try anything with a little spicy flavor! As the mother of three active children, Karlee spends her free time supporting her kids at sporting activities, and cheering them on from the stands! We’re thankful to have this smiling, informative lady on our ATC team!